The corporate insolvency resolution process, thus, can go ahead against the guarantor under Section 7 of the Insolvency and Bankruptcy Code (IBC), even without having proceeded with and exhausted all legal remedies against the principal debtor, it has said. The appellate tribunal reasoned that any corporate guarantee given by a parent company for a subsidiary becomes debt as soon it is invoked; subsequently, the corporate guarantor becomes a debtor under the terms of the IBC. “Guarantee of such nature is included within the definition of financial debt. There is, therefore, no reason why a financial creditor cannot invoke Section 7 against the corporate guarantors, once the guarantee is invoked. The judgment is within the contours of the Code and does not particularly add any additional nuances, except that it might be the first of its kind,” said Saurav Kumar, partner at legal firm IndusLaw. Section 7 deals with initiation of the corporate insolvency resolution process by a financial creditor. The appellate tribunal’s judgment came on an insolvency plea of Rural Electrification Corporation (REC) against Ferro Alloys Corporation. The latter was corporate guarantor for its subsidiary, FACOR Power. FACOR had borrowed Rs 511 crore from REC, the corporate guarantee for which was provided by Ferro Alloys Corporation. 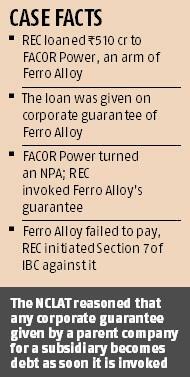 After FACOR failed on repayment and became a non-performing asset (NPA), REC decided to invoke the corporate guarantee provided by Ferro Alloys and asked the latter to pay the Rs 564 crore of total dues within 21 days of September 30, 2015. Ferro Alloys did not and REC approached the National Company Law Tribunal bench at Kolkata. It also held that the corporate guarantee provided was joint and co-extensive with that of the principal debtor.